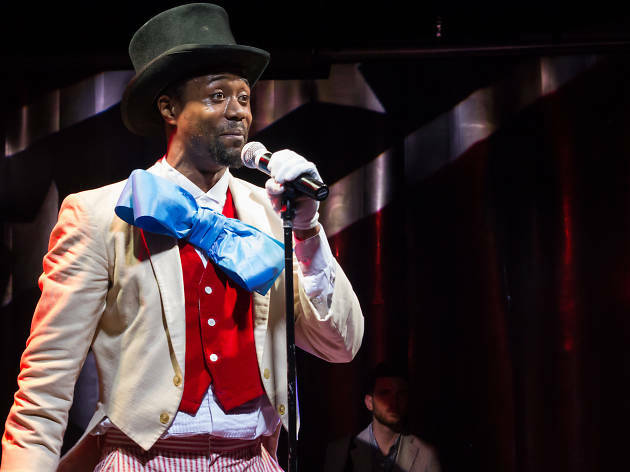 You're asked to choose your racial designation at the door to James Scruggs's incendiary interactive carnival-performance, and that's just the beginning of 3/Fifths’s funhouse-mirror reflection of American racism. Depending on whether you choose to be "black" or "white" (designated by a mark on your forehead), you'll have a radically different experience at SupremacyLand, a hellish midway that shines a garish light on the darkest corners of whiteness. And Scruggs pulls no punches. Carnival booths—staffed by cheery African-American actors with the n-word printed on their nametags—include a noose-making station, a push-button minstrel show and a "Selfies with the Homies" photo booth. Your guide? A smiling blond woman in a shiny Confederate-flag dress. 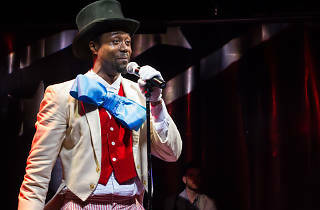 The insidious brilliance of SupremacyLand lies in the way that Scruggs, along with directors Tamilla Woodard and Kareem Fahmy, co-opt the conventions of immersive theater to deliver a powerful message. In shows like Sleep No More and Then She Fell, you're encouraged to let yourself be led by actors handing you objects and ushering you into mysterious rooms; participation is encouraged, but you walk away blameless. In 3/Fifths, the performers are every bit as inviting—everything in SupremacyLand is gamified—but what they're asking you to participating in is horrifying. Yet you do it it anyway, because it would be impolite not to, right? A trip to SupremacyLand forces you to think about your relationship to a system that keeps some up and others down. The second half of 3/Fifths is decidedly less effective: a traditional play in 3LD's basement theater that offers a behind-the-scenes look at the lives of the people who work at SupremacyLand. Whereas the interactive portion trusts the audience to reach its own conclusions, the presentational part delivers the same messages in a much clunkier way. 3/Fifths is emotionally exhausting by design, and its three-hour running time undoes some of the show's impact by pushing viewers past the breaking point. Still, 3/Fifths's shocking first half and moving conclusion make it unforgettable. It's no coincidence that SupremacyLand's majordomo repeatedly refers to returning to a time "when America was great." Scruggs, Woodard and Fahmy have created a chilling dystopia, but the scariest part is that it's not very many steps removed from reality. The show offers what may be one of the most uncomfortable experiences you'll ever have at a theater—and that's precisely the point. 3LD Art & Technology Center (Off-Off Broadway). By James Scruggs. Directed by Tamilla Woodard and Kareem Fahmy. With ensemble cast. Running time: 3hrs. One intermission. Though May 28.